Earth Hour took place yesterday around the globe, locally at 8pm. By early afternoon yesterday, the first photos and stories were coming in from New Zealand and other countries on the far side of the world from here. Ours, of course, took place at 8pm our time, and I nearly forgot about it even after all the lead-up earlier in the day. We shut down our lights and then I headed down to a spot on the lakeshore to check out the cityscape. The above photo was taken last fall, showing a city of light and colour, brightly illuminated. The spotlights are coming from the Air Canada Centre, home to the Toronto Maple Leafs and Raptors. All of the downtown office buildings are lit up, despite that it’s nearly 10 at night and one would presume even the overtime workers would have headed home. At one point I think I heard that building owners and/or the businesses renting space left the lights on as a security measure or something like that, but there’s got to be a better solution. This is the skyline last night, taken at about 8:50pm. When I was down there I recall being underwhelmed by the difference at the time. There was still considerable glow from the city illuminating the sky, though it did seem reduced. I could still see the beaver I’d disturbed from the shore swimming across the water a few metres out, in clear silhouette. I really got the best sense of the difference when I came home and opened the two files side by side on my monitor. I know that streetlights remained on during the hour, as did businesses that were still open at 8pm, for security and safety reasons. There were a few planes and a helicopter circling over the city while I was there, presumably news stations getting shots of the event from the air. On the other hand, the camera settings have a huge influence on how you perceive the scene. 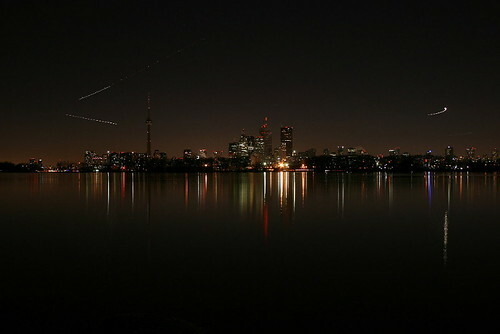 The below photo was taken only five minutes earlier, also during Earth Hour. Yet it looks like the city’s as bright as ever. The above photo was taken at F/8.0 for 20 seconds, the below photo was at F/4.0 for 30 seconds. The slightly wider aperture and longer shutter makes a huge difference in the image. I’d say my perception of the scene, by eye, was probably between the two, but closer to the first photo. The Toronto Star reports that energy consumption during that hour was down nearly 9% from comparable late-March Saturday nights. It was only down 5% from levels just prior to the start of Earth Hour, but that was likely because a number of businesses and buildings, such as the CN Tower and some of the office towers, had already turned their lights off earlier in the afternoon. Across the province as a whole (bearing in mind that many cities and rural areas didn’t actively participate the way Toronto did), energy draw was down 5.2% from normal. The Earth Hour’s launch point, Christchurch, New Zealand, had a 13% lower consumption during the hour. In Sydney, Australia, it was down 10%. I did get the impression that a lot of people didn’t participate, though, through numerous valid reasons but also some half-hearted excuses. The Toronto Star states, “Ireland’s more than 7,000 pubs elected not to take part – in part because of the risk that Saturday night revellers could end up smashing glasses, falling down stairs, or setting themselves on fire with candles. Likewise, much of Europe – including France, Germany, Spain and European Union institutions – planned nothing to mark Earth Hour. The Toronto Star had a great slide show of scenes from the different participating cities around the world. Many are very subtle before-and-afters, but I liked a number of them, including one of Sydney Harbour, from across the water. It doesn’t seem to let you grab the address for the individual images or I’d post a linked one here. 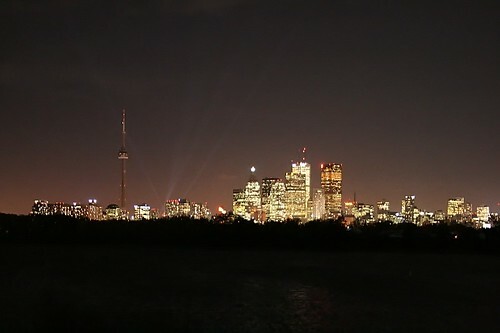 A great followup post for Earth Hour in Toronto. It looks to me like the first and second pictures are more equal in exposure because the sky colour is similar. The second picture is lovely…I don’t think the night skyline ever looked better. Where is your vantage point for the photos?? Nice dramatic photos and the link to the Toronto Star was interesting, too. Love these photos, and very nice example regarding night time photography. It is amazing what the camera can pick up with long exposures. I especially like the light trails from the planes and helicopters. Very cool. I was inside at a Jazz Concert during the earth hour, so I wasn’t able to participate, but I hope to in the future! A very dramatic event – that I missed. The photos are stunning and the story is great. Thanks! After lecturing me on the danger of candles, the little guy I babysit strolled with my partner down to Dundas Square, where they enjoyed watching a fire-eater. I stayed home. Glad you got those shots of the shoreline, and your explanation of the technical differences is…umm…enlightening? 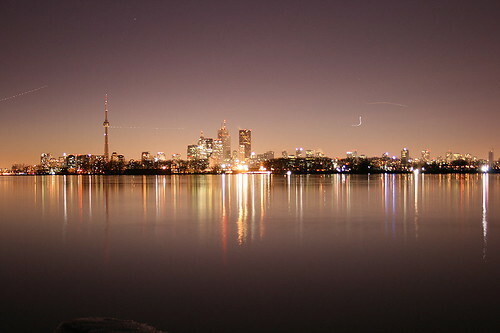 I am a Canadian snowbird who has escaped our cold winter ..to the Arizona desert.. during Earth hour I did wonder what the skyline of Toronto looked like and you have provided me with the image!! Thank you! Ruth: These were taken from the Leslie Street Spit (aka Tommy Thompson Park) towards the east end of the lakeshore. Tom: I’d like to get into more long-exposure photography, still honing my craft, as it were! There’s some wonderful long-exposure images out there. LavenderBay: A fire-eater is a bit of a change from the usual event attractions. Hope you had a nice, quiet evening at home. Naturegirl: Ah, Arizona! Would love to be there this winter, have visited the area once and enjoyed it. Some great photos on your site, makes me want to return again! Glad to have you swing by, I enjoy encountering other Canadians in the nature-blogosphere, too. These are great skyline photos — it is interesting to see the difference between the first two. I walked downtown during Earth Hour and noticed that there were only a few lights on in the office buildings, but with the streetlights and traffic (and non-participating buildings), it didn’t seem like a huge difference. I guess it’s hard not to compare it to the real blackout we had in August ’03! Anyway, the point is to start somewhere, and work on making long-term improvements, so I’m going to think of it as a great start! I was thinking of the blackout, too, when I went down to view the skyline. I happened to be out of the city at the time of the blackout, but can picture what the scene would’ve been like. It’s too bad we didn’t really come close to that – I suspect if the streetlights had gone off as well for Earth Hour, it would’ve made a very noticeable difference. As you say, though, it’s a great start since we have to start somewhere! those pictures look like they have ROD’s flying around in them .